How laddering of loans can help manage your debt? Be it credit cards, car loans, or home loans, we all end up relying on debt to finance our assets and our lifestyle. 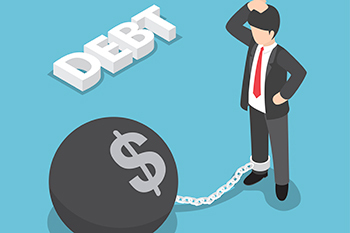 Debt is not bad if it is managed well and one of the best ways of managing debt is through laddering. These words are still relevant even after 400 years as debt is the source of most problems today. Be it households, businesses or economies, it is normally debt that takes these units to the brink of bankruptcy. Remember, borrowing is part and parcel of our lives. Be it credit cards, car loans, or home loans, we all end up relying on debt to finance our assets and our lifestyle. Debt is not bad if it is managed well and one of the best ways of managing debt is through laddering. How is laddering important in the management of debt? Laddering is all about the concept of prioritization. Take the case of credit cards. You pay an interest rate of nearly 3% per month on a credit, and when annualized, the costs are as high as 40%. Let us look at it differently. If you have a fixed corpus with you, what should you do? You can earn 9% on debt funds, 12% on balanced funds, or 14% on equity funds. Instead, if you use your funds to repay and close out your credit card, you save nearly 40% cost per annum. That is like an investment that yields a 40% return per annum. There is really no investment that gives anywhere close to 40% returns per annum with any degree of certainty. This is why when you start off on your financial plan, first have a plan to get out of debt and then think about growing wealth. Even if you are invested in a high-yielding equity fund compounding annually but continue to pay 40% on your credit card, then you are unlikely to create any serious wealth. It is not just about credit cards. You need to ladder your loans in such a way that you progressively reduce your debt as the incremental benefits reduce. Here is how to go about. You need to ladder loans as a strategy. Let us say you have four loans consisting of a credit card, a personal loan, a car loan, and a home loan. If you have received a handsome bonus this year, how should you go about laddering your loans? Here is a primer. If you got a bonus, first think about closing your credit cards. As we saw earlier, a credit card costs you around 40% per annum, so when you close your credit card you are effectively earning 40% annually. More importantly, you now have a more certain corpus that you can fall back upon to plan your future investments. When you have a credit card, you rarely pay the full outstanding. You use the 5% rolling facility and out of each 5% that you pay, you lose 3% as interest leaving your loan reduced by just 2%. That is hardly a smart way to manage your finances. First and foremost, close out your credit card debt as the biggest priority. Personal loans are good as a stop-gap arrangement. You don’t need to postpone your expenses and to that extent, they have a role to play. After certain tenure, you are just paying too much EMI in proportion to your outstanding loan. Personal loans cost anywhere between 16-18% and if you add up the other costs, they can go up to 20%. This is the second rung of the debt ladder that you should look to get out of. You not only save the 20% interest cost, but the EMI saved will become your regular corpus for investing in a SIP. Banks will insist on an exit load but you can negotiate based on your credit rating. Even after you pay the load, you are better off without the loan. The problem with a car is that its market value goes down by 15-20% the moment you drive it from the showroom to your house. The value depreciates each year and at any point of time, the loan value is always more than the value of the car. Once you pay off your credit card and your personal loan, the next step is to get out of your car loans. You can argue that it is secured by an asset but it is an asset with negative equity. Step 4 – Why you should look to tweak your home loan too? This is a slightly debatable issue. Should you close your home loan if you have the liquidity? After all, paying interest on your home loan gives you a tax exemption up to Rs2 lakh under Section 80C of the Income Tax Act. But there are two things to keep an eye on here. Firstly, today, there is no guarantee that the apartment you buy will appreciate in value. That was the case 10-15 years back but no longer. That means negative equity is a real problem in home loans too. Secondly, even in second-tier cities, apartments don’t come cheap. Your exemption limit of Rs2 lakh is hardly enough to buy a 2 BHK apartment in smaller towns. Why pay EMIs that don’t give tax exemption? While you can continue your home loan for the tax benefits, at least repay what is not tax-efficient. Loan laddering is a methodical process of gradually getting out of debt. It actually adds value to you!